This is an Indian recipe, prepared all over the country, known by different names. It is made from inner part of ridge gourd and gram flour. You will be happy to know that it can be prepared instantly, it does not require much time for preparation as such. Whenever you feel of having hot and spicy snacks, you can prepare this recipe within no time. And moreover ridge gourds are easily available in rainy season, they are grown in rainy season (in India). Choose ridge gourd which has a dark green color, tight skin and they should be free of soft spots and darkened areas. Their stems should be green and fresh looking. Ridge gourd should be heavy for their size and evenly long. Try to avoid those have signs of decomposing, including scratches on the skin or water-soaked areas or if they are soft and rubbery. If you take care of these things, this dish will be owesome. Let’s see the preparation of hot and spicy heerekai bhajji. First you have to taste the heerekai (ridge gourd) with skin, cutting the edge of it. Sometimes they taste bitter. If it tastes bitter, don’t use it, otherwise taste of the bhajji will be spoiled. 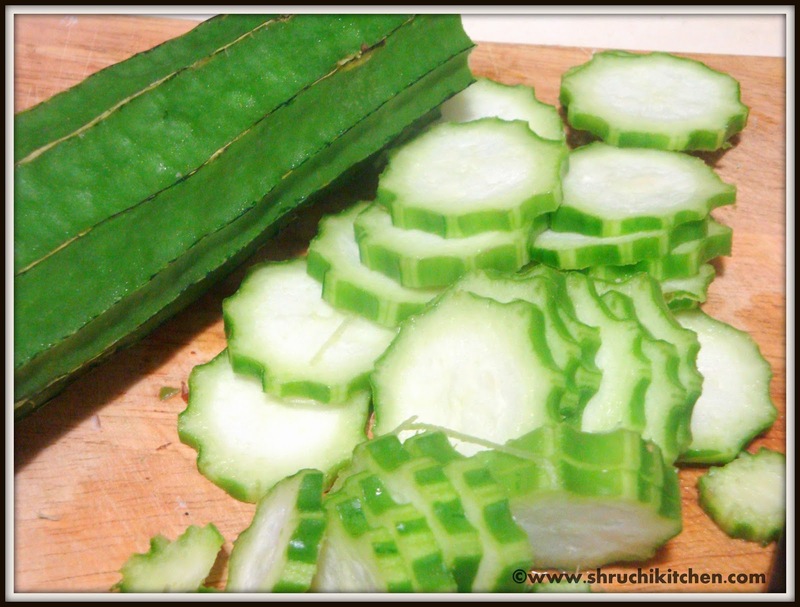 After testing the taste of all ridge gourd, peel off the skin of ridge gourd. Cut it into thin circles and keep them in a plate. Pour gram flour, semolina (bombay rawa), cumin seeds, carom seeds (ajwain), red chilly powder, hing, salt and cooking soda in a bowl and mix them together. Pour 1 tea spoon hot oil over it and mix it well with the help of a spoon. Don’t use your hand, since oil is very hot, it may burn your hand. Add 1/2 cup of water to it slowly. While adding the water, you have to stir it slowly and continuously, so that batter will be prepared without lumps. Consistency of the batter should be thick. Allow it to set until oil gets heated. Dip ridge gourd peices in batter one by one and slowly drop them in oil one by one. Deep fry them until they get golden brown colour. You can fry 4-6 bhajjis at a time. Take out bhajjis from oil and put them on a tissue paper so that extra oil will be absorbed by paper.